Twitter has just launched several enhancements that include a major redesign of its layout, the introduction of Facebook-style brand pages, embeddable tweets and a redesign of its mobile and Tweetdeck apps. Dubbed “Let’s Fly” — Twitter describes it in a blog post — the goal of the redesign is two-fold. For individuals. Twitter is opting for greater simplicity. Twitter chairman Jack Dorsey said that the company has made it “simpler not just for people already engaged, but easier for new people to discover it and find value in it.” The company also presumably hopes to lure users away from third-party apps such as Hootsuite and regain its position as the default platform where users go to interact via Twitter. For companies. With the introduction of brand pages, Twitter is allowing more advertising flexibility in the way companies showcase their brands. Twitter’s emphasis on simplicity starts with the black bar at the top of the page, which now contain a row of three buttons: Home, Connect and Discover. Twitter introduces simpler navigation using three links: Home, Connect and Discover. Home. This takes users to their home pages, which contains the tweet stream of people they follow. Other than changes to the layout, which I will discuss in a moment, nothing has changed here. Connect. This page contains tweets where the user is mentioned using the “@” symbol combined with his or her username (@username). Again, there is nothing new here other than the use of a new label to identify the page. 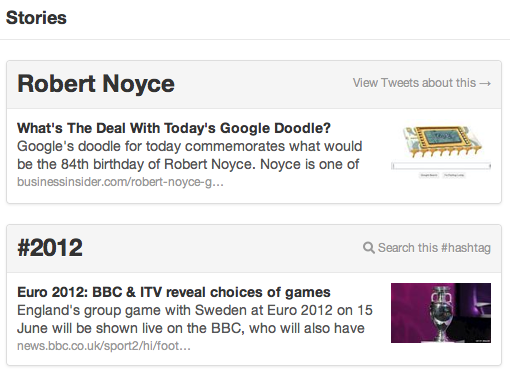 Discover is a new feature that allows users to see trending topics. When I log into my Twitter account now, this is what I see. 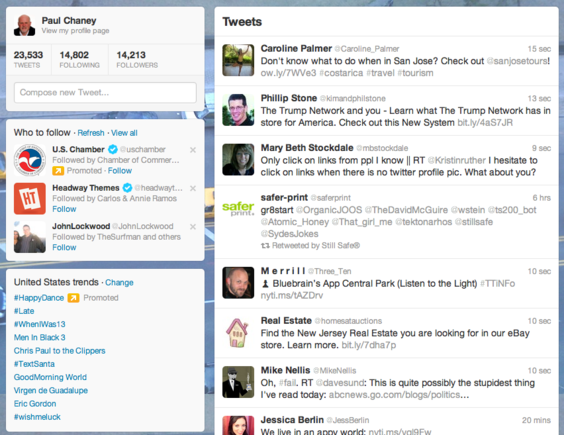 Twitter’s new layout changes the column structure; the main column is now on the right. Notice that the main column — which used to be on the left — is now positioned on the right. In the left-hand column are three boxes, one containing my avatar along with a link to my profile page, another containing suggestions of people to follow and a third listing trending topics. It’s when I clicked the “view my profile” link that I notice the most apparent changes have been made, notably the large header at the top containing a larger version of the avatar, bio and number of followers and those following me. The left-hand column contains a navigation menu along with a list of recent images. User profile pages now include a larger header banner. I clicked on several ecommerce-related company pages to see if the same layout had been implemented and found that to be the case. 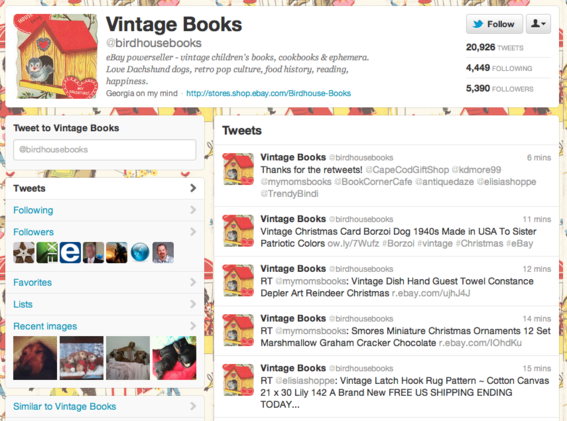 Online retailer Birdhouse Books Twitter layout. Twitter states that the new design is being rolled out incrementally across the platform, so it may take some time before everyone has the same. The company announced that the new features have already been implemented on its mobile apps, both for iPhone and Android. Visit Fly.twitter.com to learn more about these changes. You can also follow the hashtag #letsfly to keep up with news and commentary about these and upcoming changes. As mentioned previously, in an effort to maximize the value of the platform for advertisers, Twitter has introduced new Facebook-style brand pages. “You invest a lot in your brand and in driving audience engagement. 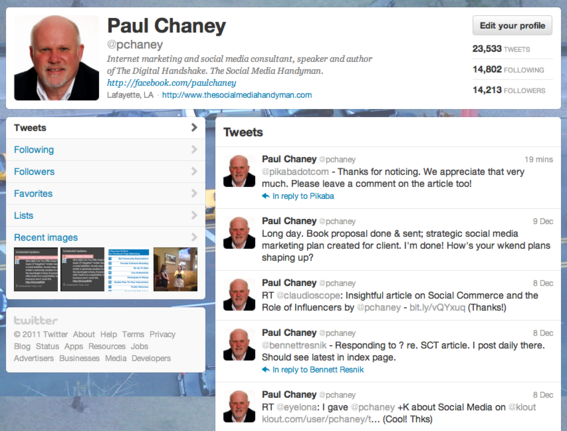 Now your profile page does more to help you present your best on Twitter. You’ll have more control and flexibility over how you showcase your brand, and your top content, to reach more users and grow your audience,” states a Twitter blog post. The new pages allow brands to add logos, taglines and other visual elements, including banner ads. 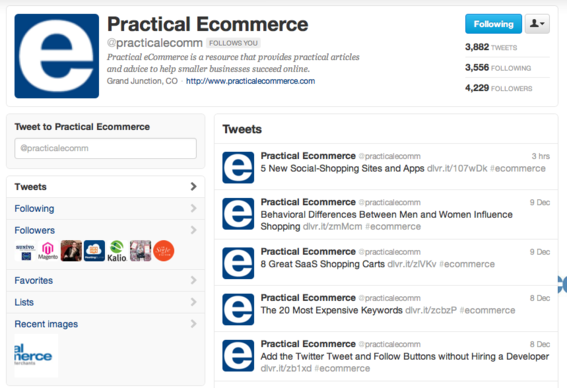 Brands can also promote a tweet to the top of the profile timeline so that it remains in place above the others. At the moment, brand pages are only available to a select group of large companies, including American Express, Best Buy, Chevrolet, Coca-Cola, Dell, Disney Pixar and others. 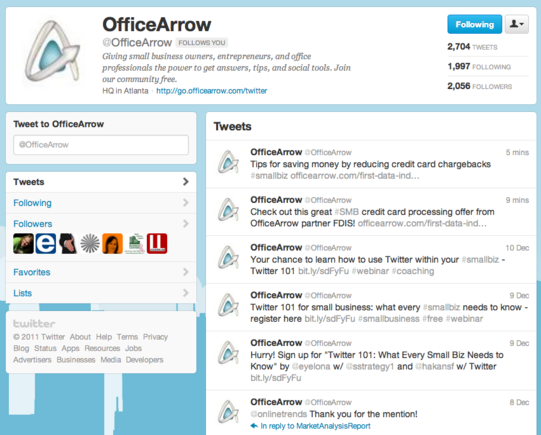 We addressed these initial branded pages in “21 Twitter ‘Brand Pages,'” an article we published earlier today. 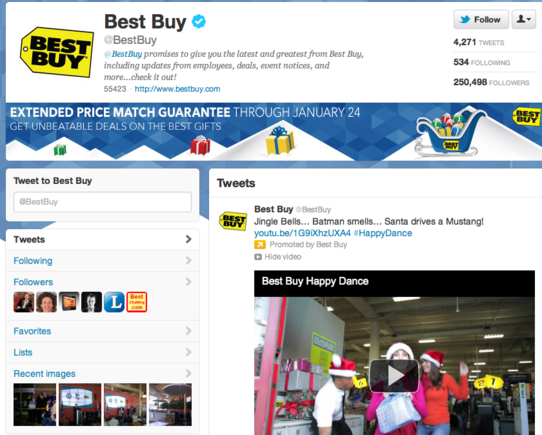 Best Buy is among select group of companies to sport the new Twitter brand page layout. Twitter says it will roll out these enhanced pages to a wider audience of brands in the coming months, but it appears these are strictly tied to companies that advertise on the social network. This comes as bad news for small companies unable to afford Twitter advertising rates, which start at $5,000 per month. On the other hand, the new layout I referenced above is soon to be rolled out on all Twitter user profiles and provides enhanced branding thanks to the enlarged header. In fact, to the casual observer, aside from the presence of added space for a banner ad, there isn’t that much of a difference. 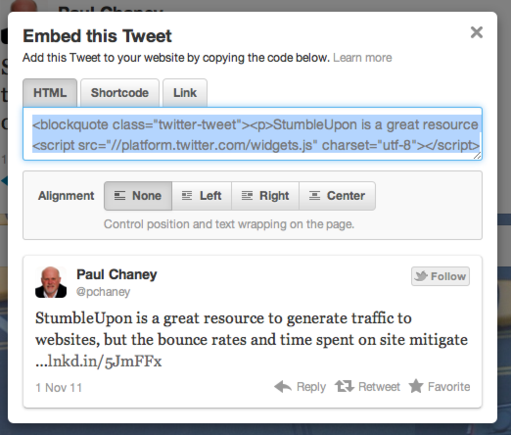 Twitter has also just introduced embeddable Tweets, which allow anyone to add a particular tweet to a website or blog. The way this works is when users click on particular tweets to expand them, a button appears that, when clicked, contains a single line of HTML code that can be copied and pasted into the site. Twitter now allows users to embed tweets on websites. Website visitors will see a Tweet that focuses on the content by surfacing the conversation and any accompanying media, such as an image or video. Visitors can follow the author with a single-click, and reply, retweet, or favorite the tweet without leaving the page, says Twitter. Special versions have been created for WordPress and Posterous users, as well. Tweetdeck, the popular third-party app acquired by Twitter early this year, has also undergone a redesign. It has moved from the use of Adobe AIR to a completely web-based version. As with Twitter.com, the design emphasizes simplicity. 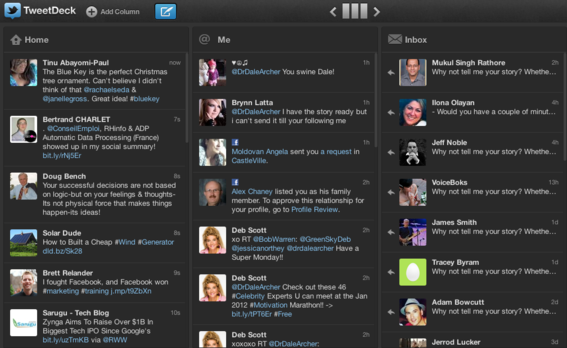 Twitter owned app Tweetdeck has undergone a similar redesign. Tweetdeck says that only Safari and Chrome browsers are supported at present, but it will soon also support Firefox and Internet Explorer. TweetDeck is also available as a downloadable Chrome app, which matches the web version entirely. Similar versions are available for Windows 7 or OS X machines.